PRICE DROP FROM $47,195, FUEL EFFICIENT 26 MPG Hwy/18 MPG City! Excellent Condition, GREAT MILES 15! MDX trim. Moonroof, Third Row Seat, Heated Leather Seats, Aluminum Wheels, All Wheel Drive. AND MORE! ======KEY FEATURES INCLUDE: Rear Spoiler, MP3 Player, Sunroof, Aluminum Wheels, Keyless Entry. 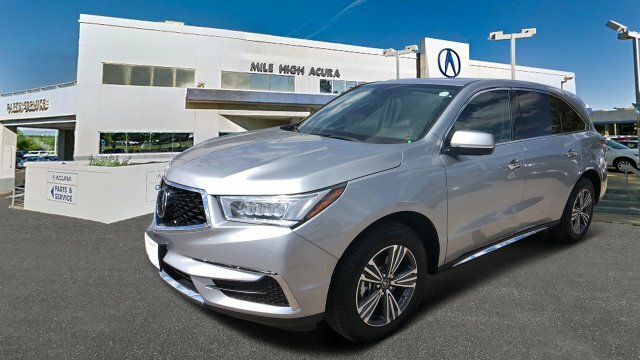 Acura MDX with Modern Steel Metallic exterior and Graystone interior features a V6 Cylinder Engine with 290 HP at 6200 RPM*. Serviced here, Non-Smoker vehicle, Originally bought here, New Tires, Local Trade. ======EXPERTS ARE SAYING: If you're looking for a family-friendly 3-row SUV with strong performance, the highest safety ratings and a luxurious interior packed with technology, you'll like the 2018 Acura MDX. -KBB.com. Great Gas Mileage: 26 MPG Hwy. ======AFFORDABILITY: Was $47,195. ======BUY FROM AN AWARD WINNING DEALER: Fisher Auto of Boulder serves the greater Denver area including Longmont, Broomfield, Lafayette, Louisville, Erie, Westminster, Thornton and Brighton. Stop in today or call 303-245-6406 to speak with a brand specialist. THE INFORMATION INCLUDED ON THIS WEBSITE DOES NOT CONSTITUTE AN OFFER TO SELL. THE INFORMATION MIGHT BE INCORRECT AND THE DEALERSHIP IS NOT LIABLE FOR ANY ERRORS. Accessories and color may vary.